Just in case you don’t know (if you’ve already know this, feel free to skip ahead), our software analyzes text and returns an OCEAN personality. OCEAN stands for Openness, Conscientiousness, Extraversion, Agreeableness, and Neuroticism. The openness category describes how open someone is to new ideas. Higher percentage scores signify a more open person while lower percentage scores signify a more closed minded person. We’d like to make a very important note here: Openness does not necessarily signify the politics that someone has. It is very much possible that someone may be a political conservative with a high openness score and vice versa. This simply signifies how receptive someone is to new ideas. The conscientiousness category describes how thorough, forward thinking, or vigilant someone is. Higher percentage scores signify a person who is more efficient, organized/thorough, forward thinking, planned, etc, while a lower percentage score signifies someone who is more easy going, less organized/thorough, spontaneous, etc. The extraversion category describes whether a person is more of an extrovert or an introvert. Higher percentage scores signify a more extraverted personality while lower percentage scores signify a more introverted personality. Agreeableness describes how cooperative, sympathetic a person is. Higher percentage scores mean the person is more agreeable and vice versa. Neuroticism describes how likely someone is to experience negative emotions. A high percentage score in this category signifies more likelihood to experience negative emotions. Fiorina scores 56% on Openness. Fiorina may or may not be open to new ideas. A score of 56% does not definitively categorize her as an open minded or closed minded person. It’s very ambiguous, even though it is higher than Sanders. In all likelihood since the score is relatively higher, this would mean that Fiorina would be willing to hear people with radical ideas out and seriously consider their ideas. She may or may not accept them of course. That depends on other factors that we do not have data on. Florin ranks 54% in the conscientiousness category. Again, this is a very ambiguous score. We cannot definitively say that she is very conscientiousness or not very conscientiousness. High conscientiousness signifies someone who really thinks his or her actions through, plans ahead and is more organized as opposed to being more spontaneous and easygoing. Since Fiorina is on the relatively higher side, probably some of her actions are more planned out than others. Which actions are determined by other factors. She scores 39% in the extraversion category. She is on the lower side of extraversion, meaning that we can say with a higher degree of confidence that Fiorina is more of an introvert. She is more reserved and does not have outward energy towards others. She is not the sort of person you would find at large gatherings. An introvert tends to prefer doing things alone. Introversion does not mean a fear of social activity, just a preference for non social activities. She is 63% agreeable. A score of 63% agreeable denotes somebody who is highly agreeable. Someone who is highly agreeable generally gets along well with others, is trusting of others, straightforward, etc. Carly Fiorina is an agreeable person overall. Now for neuroticism. This is an interesting score for Fiorina. She is 45% neurotic. Although it’s an ambiguous score, it’s still quite telling about Fiorina. She scores lower than Bernie Sanders, who got a 55% on the score. Being neurotic means that a person is more likely to experience negative emotions, react badly under stress, etc. Fiorina is not on the higher side for neuroticism, but is ambiguous. She may react well under some circumstances but react badly under others. Now that we’ve seen two presidential candidates’ neuroticism scores, perhaps we should compare this to the current president as a benchmark of sorts. President Obama scores 24% in neuroticism. 24% is extremely low. It means that he’s the kind of person who’s cool under stress. Neither Fiorina nor Sanders can compare to Obama. It is entirely possible that this is reflective of everyone’s current stress level. Fiorina and Sanders have the stress of winning the nomination. President Obama is a last term president: he’ll be done soon with the presidency and therefore does not need to take much stress. To some extent, it may even show how desperate the candidate is to win the presidency. And that’s Carly Fiorina’s personality analysis for you. Stay tuned for more posts in our Presidential Charaktereigenschaften. 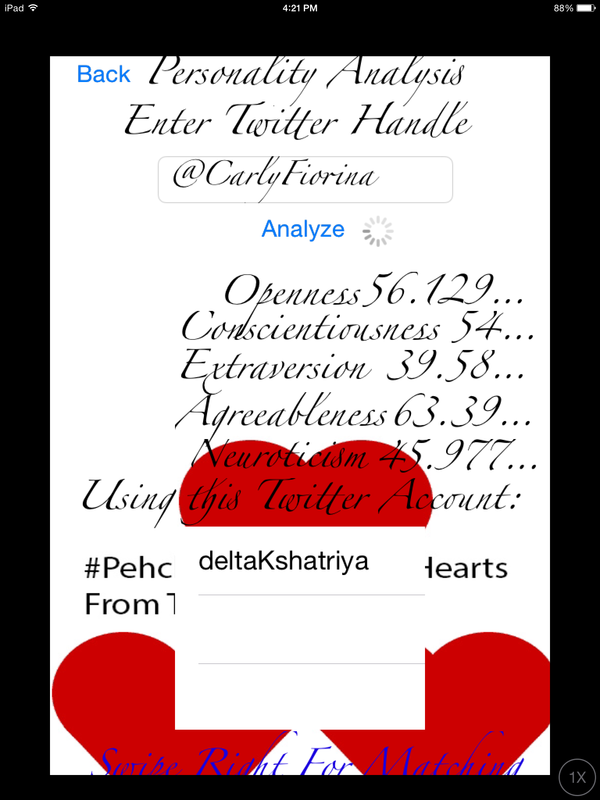 We used our software, Pehchaan, to analyze Sanders’s Twitter account. Download it here. Our software analyzes text and returns an OCEAN personality. OCEAN stands for Openness, Conscientiousness, Extraversion, Agreeableness, and Neuroticism. The openness category describes how open someone is to new ideas. Higher percentage scores signify a more open person while lower percentage scores signify a more closed minded person. We’d like to make a very important note here: Openness does not necessarily signify the politics that someone has. It is very much possible that someone may be a political conservative with a high openness score and vice versa. This simply signifies how receptive someone is to new ideas. The conscientiousness category describes how thorough, forward thinking, or vigilant someone is. Higher percentage scores signify a person who is more efficient, organized/thorough, forward thinking, planned, etc, while a lower percentage score signifies someone who is more easy going, less organized/thorough, spontaneous, etc. The extraversion category describes whether a person is more of an extrovert or an introvert. Higher percentage scores signify a more extraverted personality while lower percentage scores signify a more introverted personality. Agreeableness describes how cooperative, sympathetic a person is. Higher percentage scores mean the person is more agreeable and vice versa. Neuroticism describes how likely someone is to experience negative emotions. A high percentage score in this category signifies more likelihood to experience negative emotions. Now to analyze Bernie Sanders’s Twitter profile! Let’s start with the first trait. Sanders ranks 39% on openness. 39% is a relatively low score for openness. Sanders as a candidate is not very open to new ideas. As a person he would not be very interested in seeking new experiences. If we examine his campaign we do see an overall trend where he is very much grounded in his own ideas. He is not very receptive to ideas that contrast his own. He ranks 59% in the conscientiousness category. This is a relatively high score for this category. Generally speaking, he’s likely to think everything through before making a decision. He’s very a very deliberate, goal-oriented person. He is very focused, hardworking, and reliable. Applied to Sanders as a presidential candidate, it would mean that he is very focused on the reforms he wants to bring to the US. He is reliable in the sense that he does not make idle promises. Sanders has a score of 43% in the extraversion category. 43% is also a relatively lower score for extraversion. That being said, we cannot definitively say that Sanders is an introvert. Sanders is more likely an ambivert, based on this score. That means that he has some traits of an extrovert and some traits of an introvert. Which traits he has we cannot definitively say. In all likelihood, Sanders is likely to be more on the introvert side. Now for agreeableness. This score is the most interesting for Sanders as he has made significant gains in the polls in New Hampshire and Iowa in recent weeks. Sanders ranks at 43% for agreeableness. Again, this score is on the lower side, but is still not signifying of a person who is clearly not agreeable or agreeable. Generally speaking, a low agreeableness score signifies that someone is less trusting of others, has less empathy, and is less likely to be cooperative. Again, we cannot definitively say that Sanders is definitively on the lower side for agreeableness. He is probably a mix of both spectrums, leaning slightly toward the lower side. Sanders has a score of 55% for neuroticism. This is a relatively high score, but not high enough for us to definitively characterize Sanders as a neurotic. Being highly neurotic means that a person is more likely to experience negative emotions. It means that a person does not fair well under stress. For a presidential candidate, if ISIS, in theory, were to capture Baghdad, neuroticism describes how he/she will react to that kind of stress. Sanders is probably somewhat neurotic. So there you have it. Bernie Sanders’s profile tells us a lot about him. Stay tuned for more posts in our Presidential Charaktereigenschaften. Next week, we will analyze a Republican candidate! Presidential Charaktereigenschaften: What’s the Personality of the Presidential Candidates? Today we’d like to announce a new blog series from Kshatriya Softworks. Using our Pehchaan software we will analyze the US presidential candidates Twitters profiles, speeches, debates, and more and post our results here. Stay tuned for more!